I really like the cut out detail in these and the coral color is SO pretty! Cobalt blue is one of my favorite colors! The lace up detail is really cute. The stripes on the wedge give these a nautical feel! They are also available in 2 other colors I believe! Kate Spade has so many cute shoes this season! I love how colorful these are! They would look so cute with a white dress! I'm loving all the lace up shoes! These come in camel and navy shades as well. This 'chili' color is gorg! And I love the lace up detail in these! So many of the bloggers that I follow own these and I think they are so cute! These are just classic style wedges. They come in like 5 other colors, too! I just picture these with ripped white jeans and a solid color top! I get so excited to wear wedges when Spring rolls around! Bright colors are also a must... so bright wedges?? 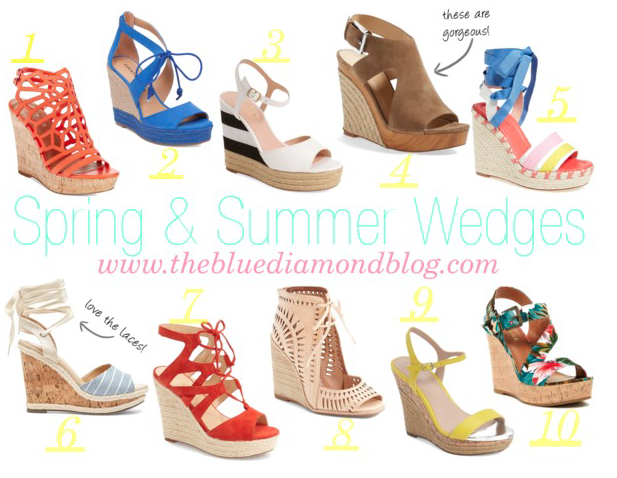 I decided to round up some bright colored wedges that would be perfect for Spring and Summer!